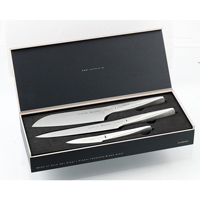 A high quality cutlery set is the smartest and way to fill out your essential kitchen toolset. It also makes for a perfect gift that your loved ones will gratefully remember you for every day they use it. Here we offer our ultra-versatile, high performance all-purpose knives which never need sharpening as well as a wide selection of traditional high-end forged block sets for differing tastes and needs.